Tom & Jennifer Roth started serving ministries by offering graphic design and communication services. In 1990 they started Business & Communication Services to use profit earned to finance continued ministry efforts. In 2002 Tom stepped away from his 25 year career in the dairy industry to participate full time in this small business venture. With a desire to invest their time in work that would be "treasured" rather than "trashed", they turned their efforts to Heirloom, which specializes in photography, photo preservation and DVD production, as well as the ministry of Can Do Kids. Over the years we have continued to use our time, talents, and finances to help various ministries serve more effectively and efficiently. However, in 2007, God took us in a new direction and gave us a vision for serving children through Can Do Kids. We have developed curriculum for children's ministry and have a local program serving nearly 200 children per week. In 2011 the curriculum was adopted by another church and in 2012 we were invited to start a Can Do Kids program in Kenya. In addition Can Do Kids has "adopted" several schools within the central region of Kenya to help develop infrastructure to improve the level of education. With opportunities to serve more children in the US, Kenya, South Africa and other places in the world, we will continue using our time, talents and finances and encourage others to do the same. 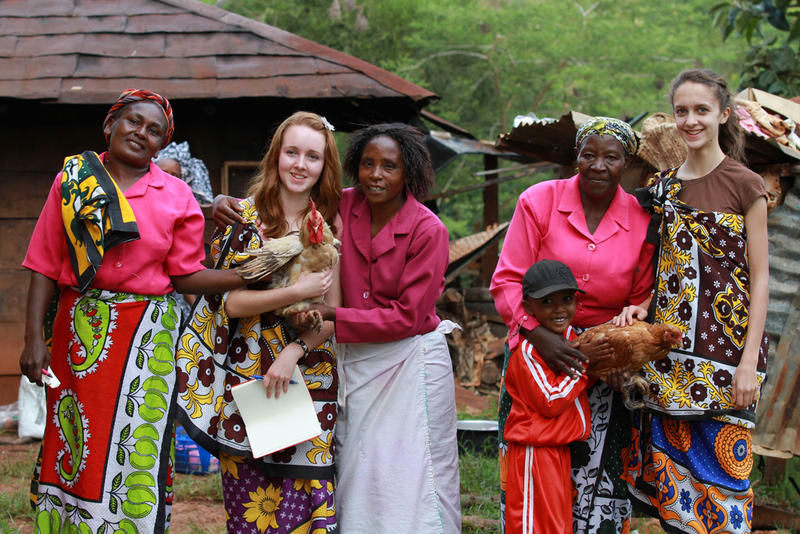 Above: While visiting a women's gathering in Kenya our family was offered two live chickens as a gift of appreciation. Our daughters graciously stepped in to accept the gifts.